Memories of the Lovable but Dimwitted Duo – Travel. Garden. Eat. 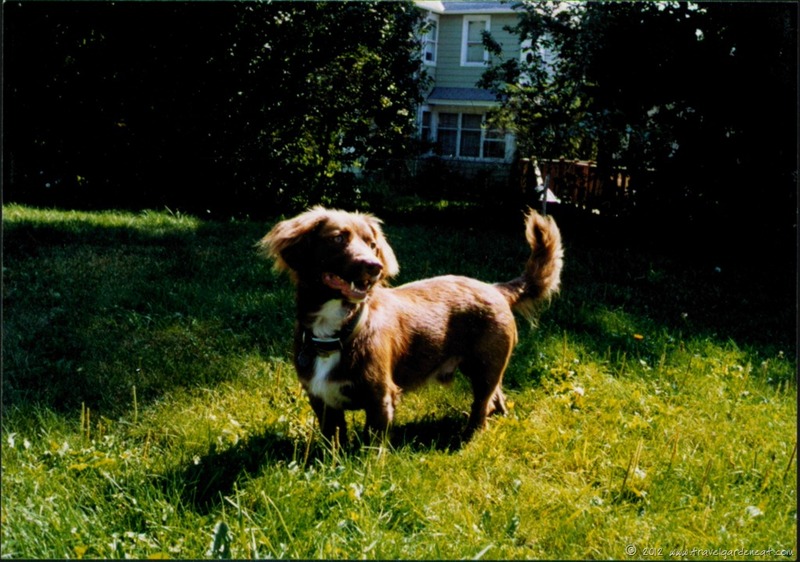 Duffy was a mutt who appeared to be the product of a child’s imagination gone wild — dog parts selected from multiple breeds and merged together in a one-of-a-kind way. A classic humane society rescue dog. 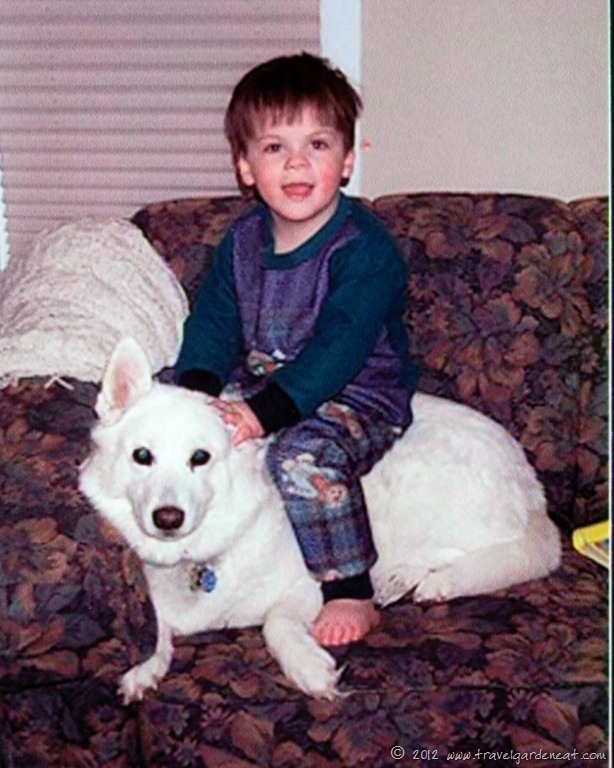 He had been neglected at his first home, although not abused, as he was always was a trusting soul. He came to us severely underweight and malnourished, and having no knowledge of the joy of attention and physical love from human companions. We brought Duffy into our lives when he was not quite a year old, as our first dog Bruce (not yet two years old) came to the premature end of his, suffering from uncontrollable seizures and medicated to the point that his quality of life was no longer positive. We adopted Duffy, thinking that Bruce would like the comfort of a companion as he declined, and that we would have a companion as we anticipated the need to help Bruce say good-bye and ease his pain. 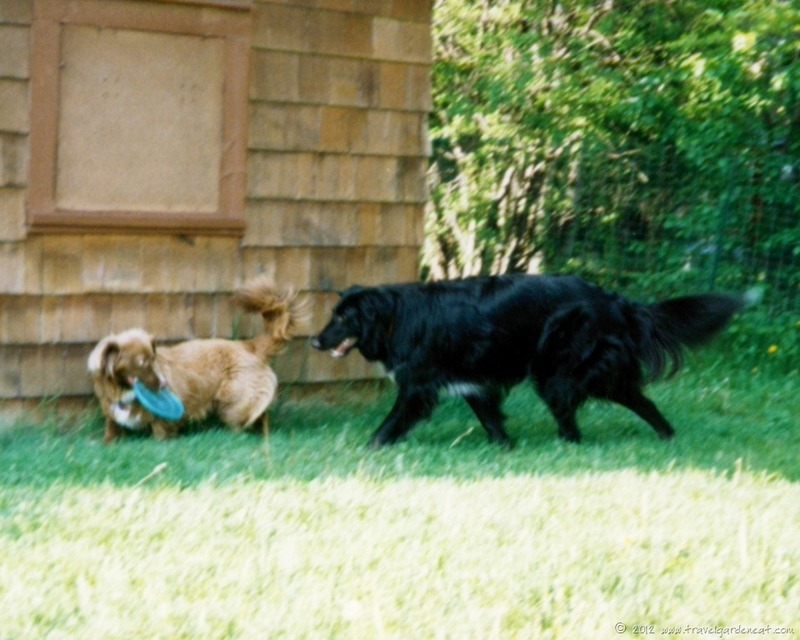 We could not have asked for a better companion for our ailing Bruce than Duffy — that goofy-looking mutt adored Bruce. He gave Bruce moments of renewed playfulness and joy, but could not stop the inevitable decline that was only months away. Duffy was inseparable from Bruce, until the end. Tearfully, we said good-bye and soon learned that Duffy needed his own companion now that Bruce was gone. Duffy cried. He barked a neurotic, repeated bark after he lost his friend. We were no substitute for the emptiness that poor dog obviously had gnawing at him inside. So, off to the humane society we went in search of a friend for Duffy. This resulted in Snowball (“Snowy”) joining our little family. She was not quite a year old when we adopted her; Snowy had been her name while in foster care with her pups. Her previous owner had abandoned her while she was pregnant. The neighbors in the rural area became aware of her plight, and cared for her until the pups were old enough to be adopted themselves. 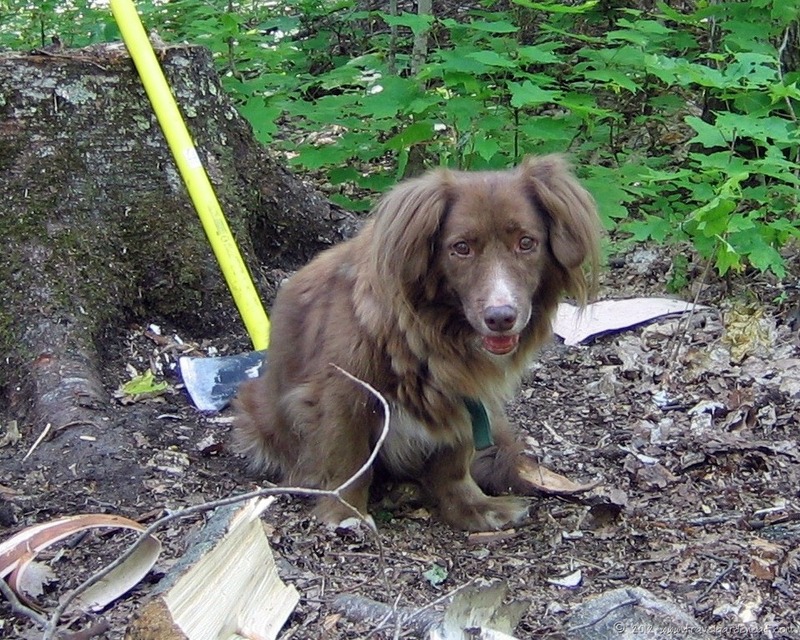 The neighbors told the humane society what a protective and caring mother Snowy was to her pups, digging out a little den under a woodpile on the property. She obviously had not had a good life leading up to that young stint of motherhood, as her ears already were scarred with frostbite nicks from her first winter. 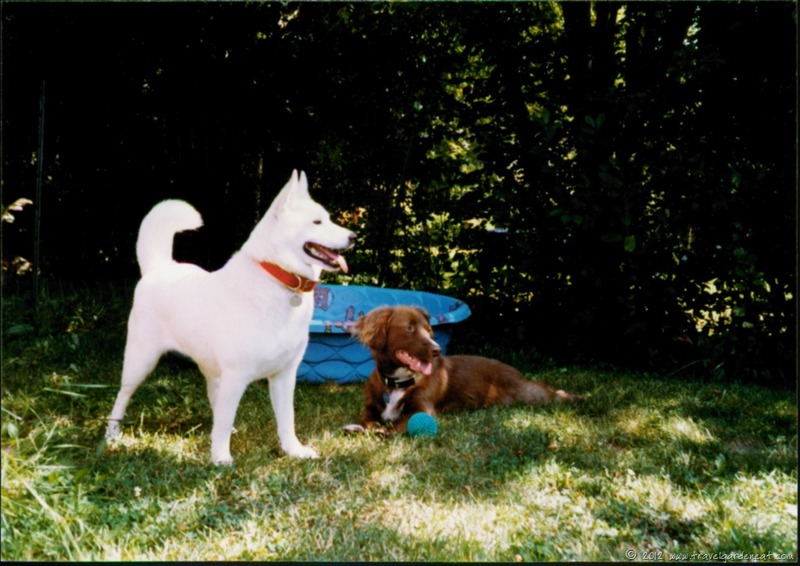 Snowy was always somewhat standoffish or even crabby toward other dogs . . . except for her forever friend, Duffy. They bonded from the moment they met, and became inseparable for the next 14 years. (I admit to tearing up, as I reflect back on the incredible love those two animals had for each other, and for us, their human family). They were our “children” for several years, before our first two-legged child was born into the family. Snowy and Duffy had it rough . 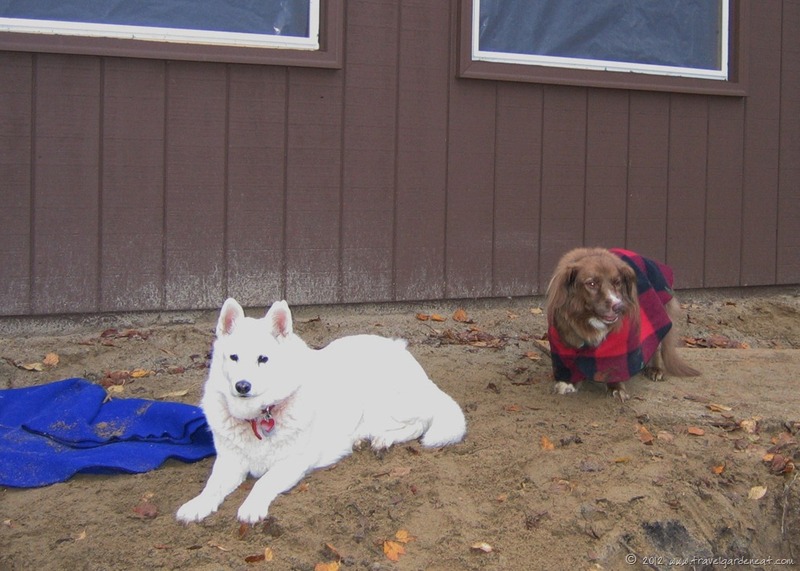 . .
My husband and I took Snowy and Duffy to obedience class soon after they joined us, each taking responsibility for one of them during each class. We quickly learned that we needed to separate ourselves to opposite sides of the classroom, because our dogs otherwise would not focus on the task at hand; rather, they focused on each other. 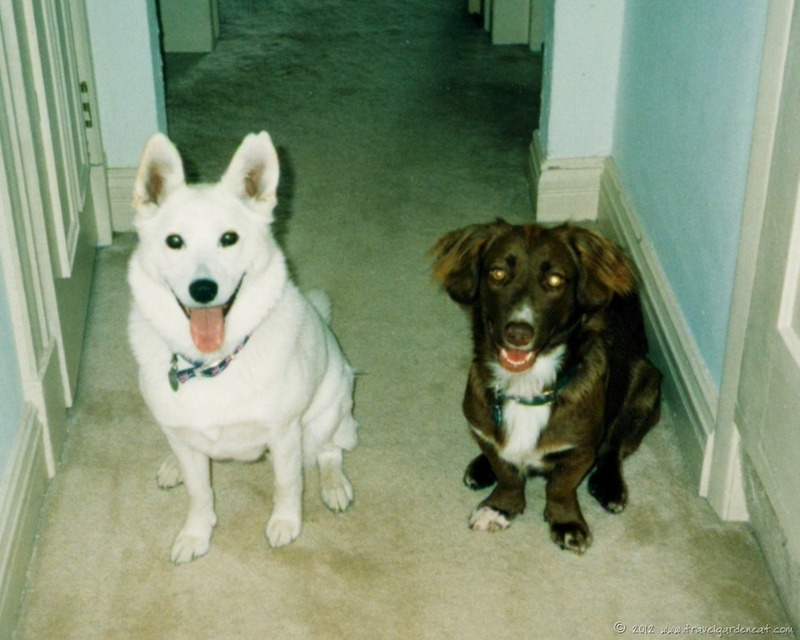 Even when separated, Snowy would cry and whimper from across the room whenever we stopped our heeling exercises — any extended “sit” or “stay” resulted in her looking longingly toward her buddy, accompanied by her whiny laments. Snowy was the ring leader of our lovable but dimwitted duo. Perhaps it was the lack of nutritious sustenance for much of the first year of his life, but Duffy was not blessed with an abundance of intelligence. If dogs could talk, I am sure many of their exchanges would consist of Duffy saying in a bumbling, excited manner, “what do you think, Snowy, huh? huh? huh? should we run? should we play? yes? no?” And as soon as Snowy gave the signal, off they would go, racing playfully together, wrestling, snuggling, loving with a connection that words cannot explain. From their harsh first year of life, Snowy and Duffy transitioned easily to lives as spoiled and much-loved pets. And they again transitioned beautifully to the role of children’s friends and companions as our family grew to add two boys over the next few years. 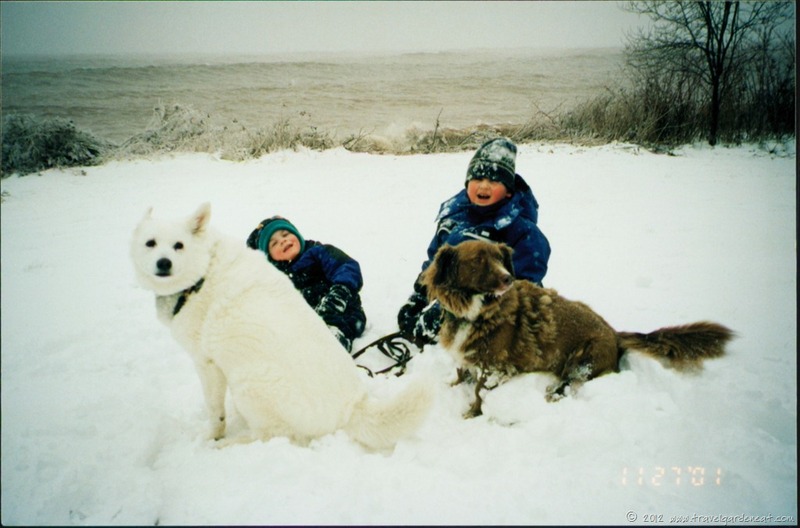 Those dogs are intertwined with the memories of our boys growing up. 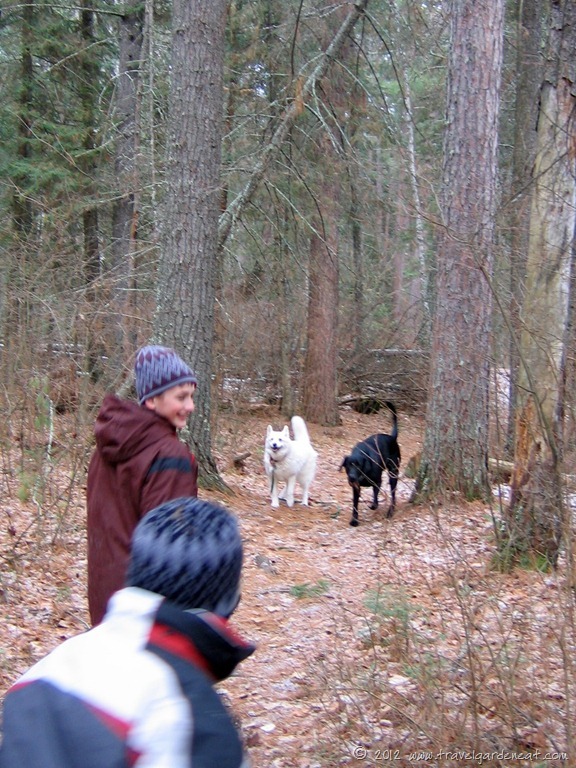 Hikes, imaginary play, wrestling, romps in the snow — Snowy and Duffy were there. Patient, loving, forgiving. The unconditional love that animals bring to our lives was exhibited in this goofy twosome time and time again. No better love . . .
Time at the cabin and on the lake were times of bliss for those two (not to mention the rest of us). They were with us for the first few summers we camped on the raw land (and Snowy was with my husband and son during a thunderstorm when she bolted straight through the zippered door of the tent, because she did not want to be left alone in the tent in the storm when my husband went to the car to retrieve something . . . . that neglectful first year of life resulted in some needy, neurotic tendencies on both Snowy and Duffy’s parts, but can you blame them?). Swimming with the boys, fishing off the dock, enjoying pontoon rides on the lake. 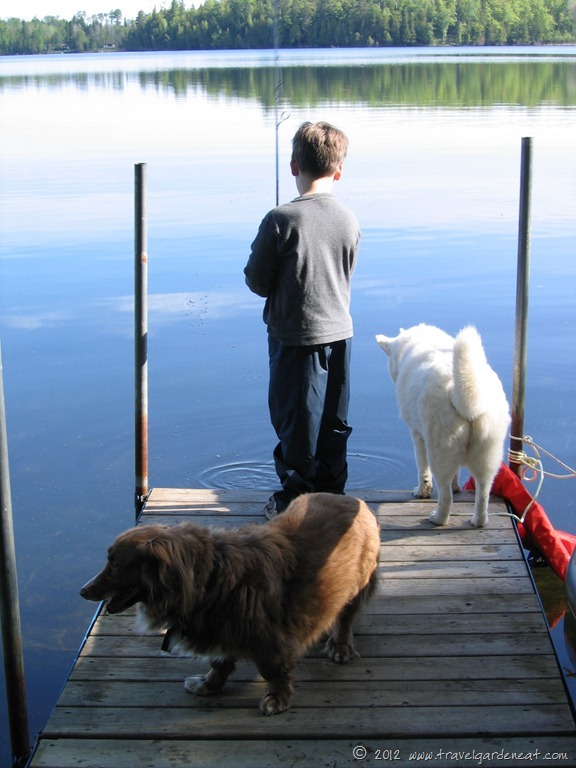 The memories of the first few summers when we enjoyed time at the lake were inseparable from memories of the dogs enjoying time at the lake. As our boys grew, the dogs simply aged. The pace of hikes had to slow and shorten in distance, as Duffy was the first to remind us that they would not be with us throughout the boys’ childhood years. 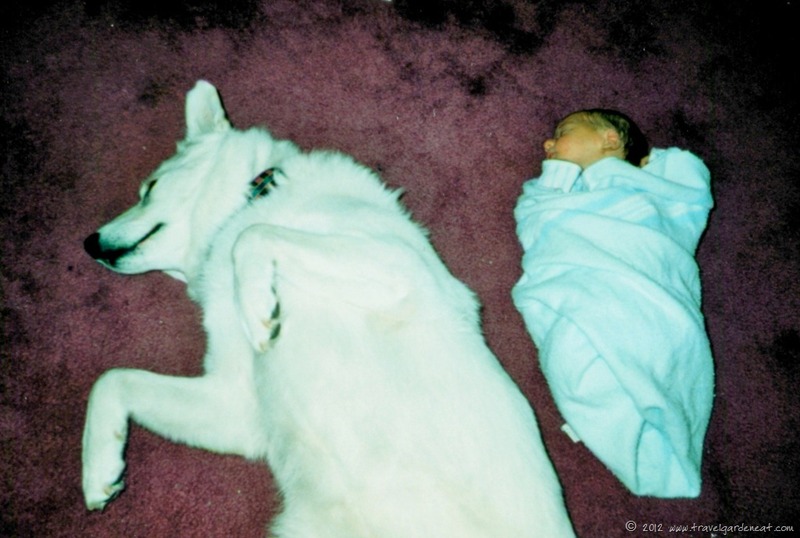 As is often the case with older dogs, they lost muscle tone and layers of fat, although Snowy’s Samoyed-Husky fur kept her cozy on the coldest of days even as she reached the end of her life. I made Duffy a little polar fleece jacket for late fall nights at the cabin, before we had a heat source to keep the interior toasty warm. My husband would take Duffy onto the cots we slept on at the time, tucking him into the sleeping bag where Duffy would sleep with a happy sigh (after first repeatedly grunting for more tummy scrubs). 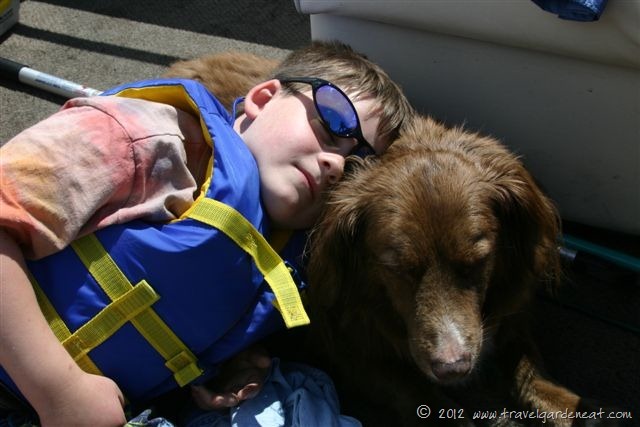 Duffy turned 14; we knew it was probably his last summer with us, as he began to lose control of his rear legs and mobility significantly declined. One of the most difficult things about owning a pet is knowing when it is time to help them say goodbye. 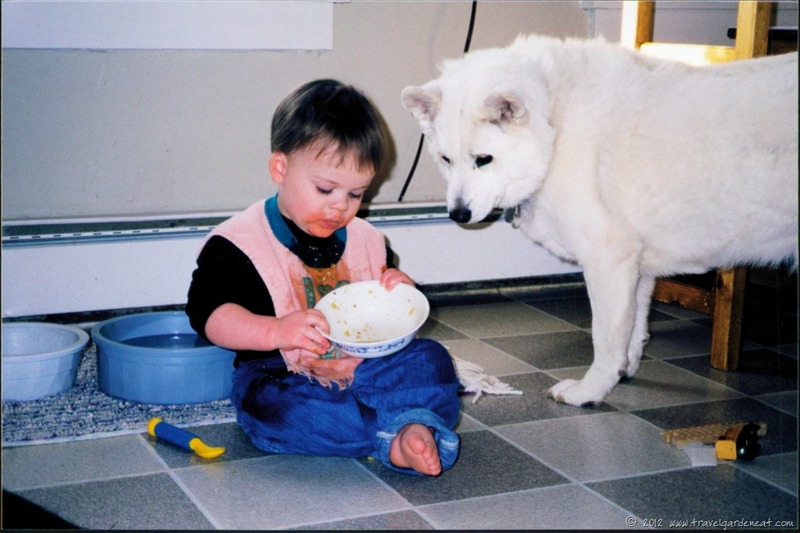 The answer rarely presents itself in black-and-white, and no matter how many furry friends you have been fortunate to know over your lifetime, it never gets any easier when it comes to helping them . We had a family wedding to attend mid-summer, and so we left Duffy and Snowy with the same caretakers we had used (and Duffy and Snowy had loved) for the prior 13+ years. One morning, only a couple of nights into our week-long vacation, I received a tearful call from the woman caring for them. Duffy was at the vet and he had tummy twist (bloat). Why it happened, no one will ever know, but given his already fragile elderly state, surgery was not advised. Our vet and vet’s staff stood compassionately in our stead as they eased Duffy across the “Rainbow Bridge.” To say that tears were shed by us during that day, and on and off throughout the remainder of our vacation, would be an understatement. The next morning, I woke up with the most vivid dream seared into my mind. I told my husband that Duffy came to me that night, looking healthy and happy, leaning into me as I ran my fingers through his cinnamon-colored fur. I could feel his fur, feel his presence — it was not the typical feeling or memory one has when trying to recall a dream from the night before. My husband had an odd look cross his face as I told him this, and he said quietly, “Duffy came to me in a dream, too.” He had the same sensation of petting him, feeling his fur, and that sense that Duffy was at peace. My oldest son claimed he dreamed of Duffy that night, as well, while my youngest son burst into tears because he could not recall having seen or felt Duffy in his dreams. 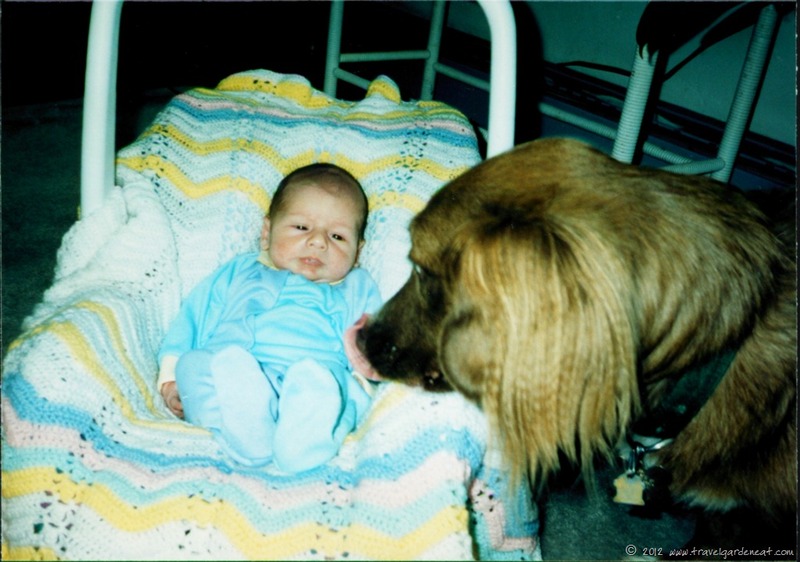 We assured him that Duffy would not have missed visiting him as he made the rounds to all of us, letting us know that he no longer was in pain, and that we need not worry about the fact he passed without us being there to say our goodbyes. He came to us to say goodbye instead, just another example of that purest of love that sometimes only an animal or child can seem to share. Our vacation ended and we picked up Snowy from her caretaker, bringing her home alone. As she ran into our house, we realized that she thought Duffy must be waiting for her at home. She frantically searched from room to room, whimpering in an increasingly panicked manner, which brought a new round of tears and feeling of helplessness on our part. Once she realized her faithful friend was not waiting for her, she sunk into the deepest of depressions and appeared to even suffer a seizure at some point. She stopped eating, withdrew, and was inconsolable. We made a trip to the humane society and we hoped that perhaps Snowy would find some solace in another dog companion. Perhaps it was the taking of interest in a new friend, or perhaps it was just that Snowy was a tough old bird who was not going to give up on life that easily, but remarkably, Snowy was like the phoenix, rising again and enjoying life to the fullest for another three years, exceeding the ripe old age of 17! 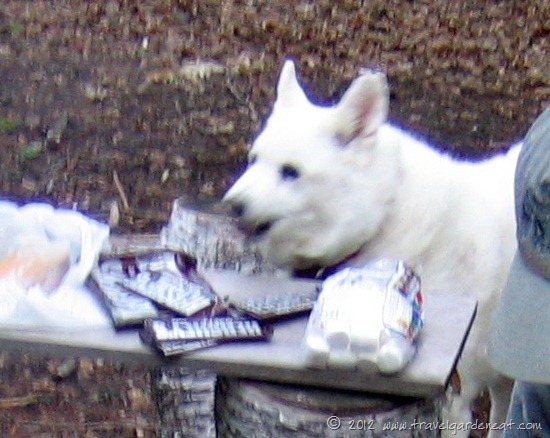 When she turned 16, we had “Snowy’s last birthday” party at the cabin, as she was increasingly showing her age and we figured it would be her last. The next year, we had the second annual “Snowy’s last birthday” party! 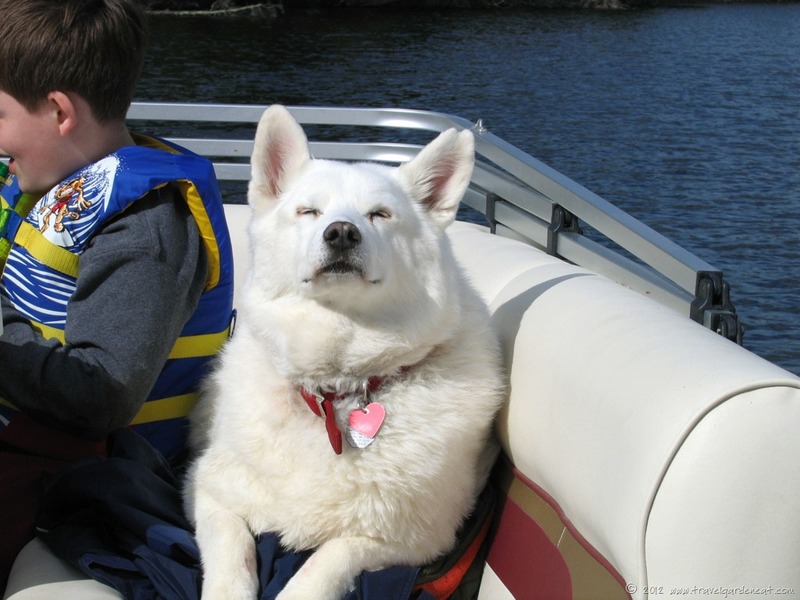 At her second “last” birthday party, on her 17th birthday, Snowy started marching slowly down the hill toward the lake, zig-zagging to minimize the strain on her arthritic and weakened joints. 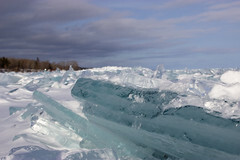 Over the previous couple of summers, she had voluntarily wandered down to the lake less and less frequently. 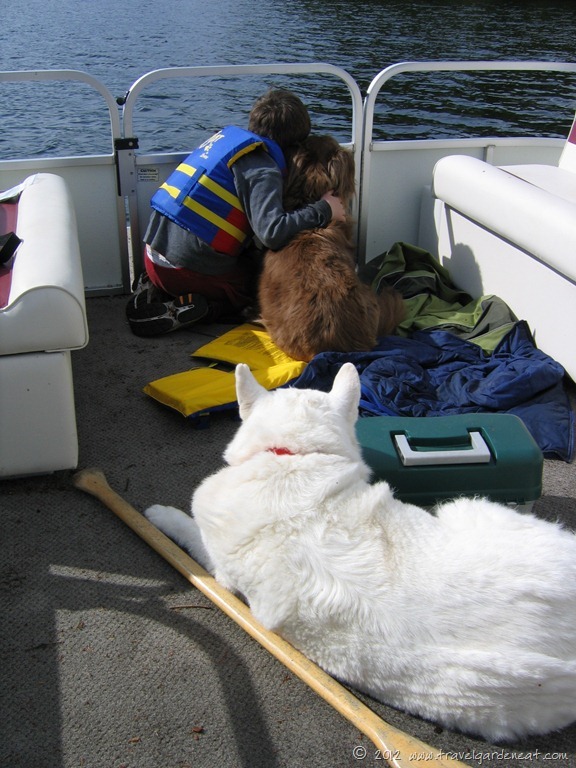 My husband would carry her to the pontoon a few times each summer so she could enjoy her favorite boat ride and a paddle in the lake. 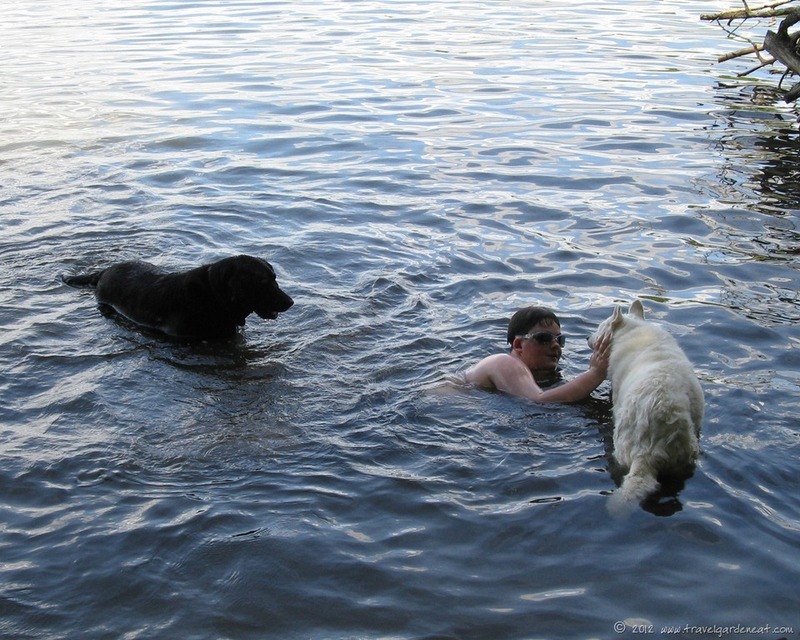 She was determined on her birthday, though, and celebrated turning 17 by taking herself for a swim, joined by her new furry friend and my youngest son. We all watched in awe as she swam and enjoyed wading in the water. No one had to say out loud what we all knew — that this was likely one of her last ventures down to the lake to enjoy some of the activities she enjoyed most in life, with the people she loved most, who loved her right back with all of their hearts. That fall was her last with us. On Thanksgiving Day, we ventured out for a short hike. 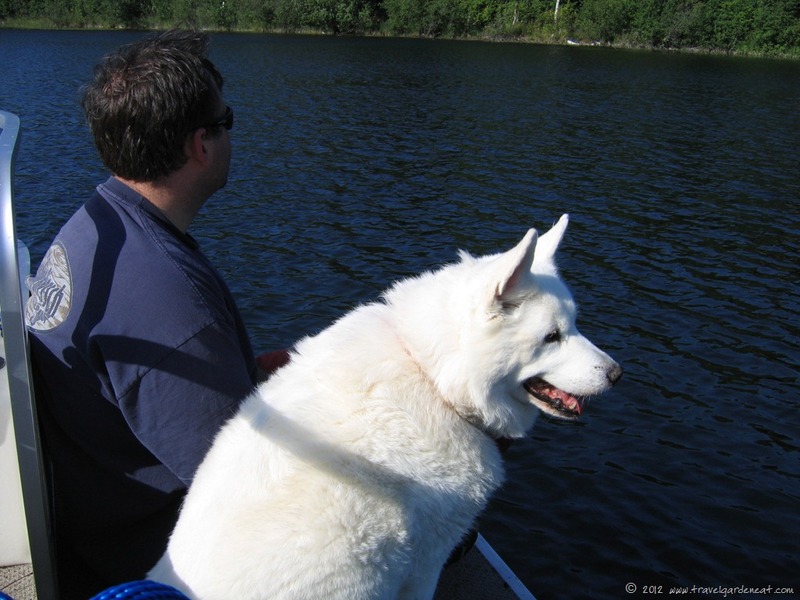 In the past year or two, when heading out for longer or more strenuous hikes, we would reluctantly leave Snowy behind, knowing she no longer had the strength or endurance to join us. It was a holiday and no one was in a hurry. We just wanted to wander leisurely through the forest and enjoy our family time together. 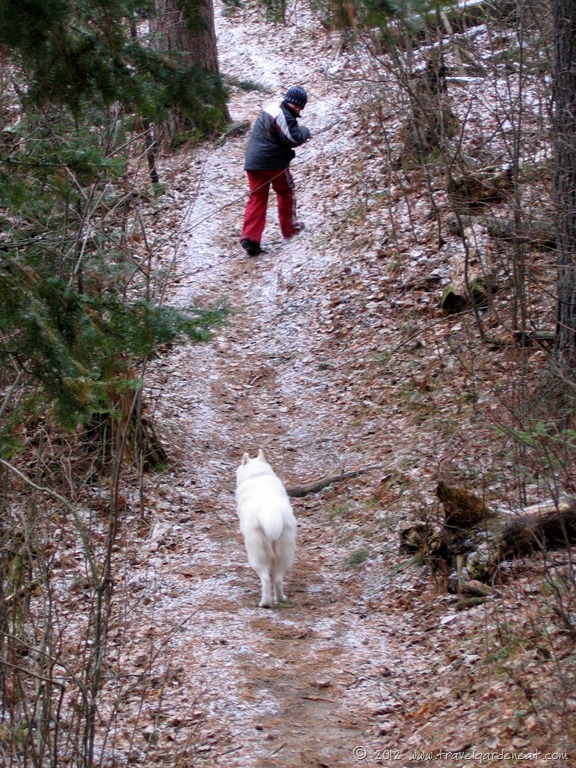 As I look back at these photos from that hike, some of the last that we have of Snowy, I see that happy grin on her face as she and our lab wait for the boys to catch up. Once again, she surprised all of us, even galloping exuberantly on the trail for a brief time, always with that dog grin, barking playfully as the boys ran past. The joy she so obviously experienced that day was infectious. With another Thanksgiving holiday approaching, and that often frenzied holiday season already nipping at people’s heels, perhaps we can take a cue from our animal friends as we did on that Thanksgiving several years ago. We all slowed our pace to enjoy the day with Snowy, and were reminded of one of the important things in life — that in this finite time we have together, we should always try to find joy in the moment and enjoy the simple things in life. That was incredibly beautiful, Kat. Thanks so much for sharing this. Nope, I just have to think about stories like these (which you seem to have plenty of 🙂 !) when I feel guilty about Zachary asking for a dog on about a daily basis! That was a beautiful post!! Thank you so much for introducing us to Snowy and Duffy too!! Lovely post. Dogs remind us of the importance of being present and mindful. I wasn’t a dog owner until we got our fur baby 13 years ago. She keeps us grounded and balanced in our life and brings us countless joy. 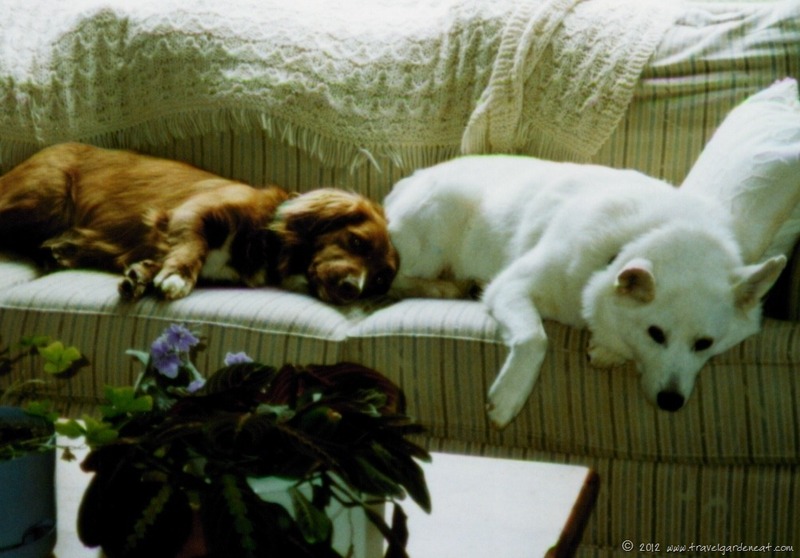 Duffy and Snowy were lucky to have found each other and your family. Fabulous shot….especially the tiny claws. Spectacular – especially the details of the feathers. Gorgeous photos. The green in these photos is so vibrant. I think the frog looks like he visited your favourite watering hole! Hehe. Oops – damn iPads. Sorry about that. I was commenting on Ron Mayhew’s photos. No worries — Ron’s photos are great! Kat, I’m sitting here bawling like a baby. It’s been over a year since we lost our two big dogs within three weeks of each other, but I still miss them desperately. They came to me a few times in dreams. I didn’t dream about them … they came to see me. It was as though they wanted me to stop crying and know they were all right. … This was a wonderful post with wonderful memories and pictures. Thank you for sharing. Your post was so poignant – runny nose and teary eyes because it strikes a chord so strong in us dog-owners. They say dogs in our dreams are messengers- from my experience, and yours, I would have to agree. In real life, We are working on something to make our best friends’ lives a little healthier and easier- will email you all about it when we are close to completion… Love the pup you’re with! I look forward to hearing more! Definitely love the pup (or kitty or whatever your companion animal choice may be) you’re with! Gosh, Kat, I wasn’t ready for that tear-fest. This is beautiful and heart-wrenching and I completely understand the emotional attachment. The dreams, though, are really something – I’ve not experienced that, even having lost a number of pets over the years. So moving & heart touching, i could actually feel a lump in my throat as i read through your beautifully written post! Glad to have stumbled upon your post! What a beautiful and touching story, Kat. I was tearful as I read it and still have a lump in my throat. 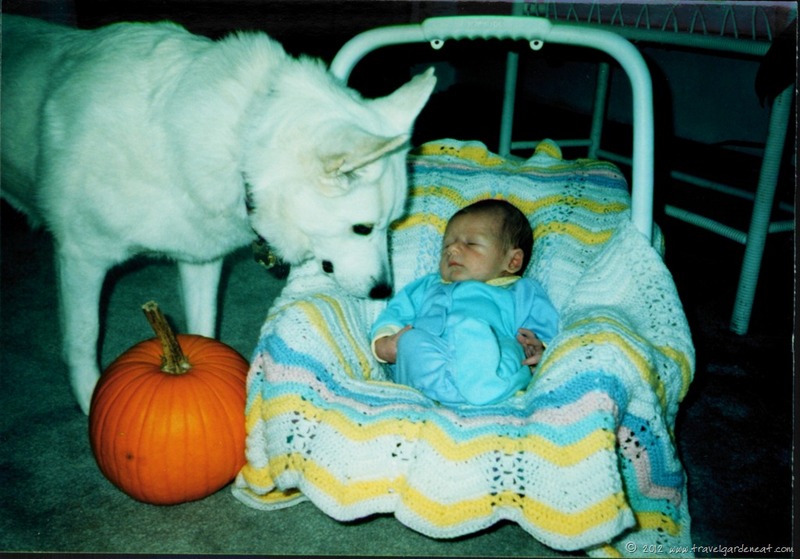 We recently lost my Mom’s dog, our “family dog,” just shy of her 15th birthday. I found great comfort in reading your story. You paint a beautiful picture — and your photos are lovely! It sounds like you shared many special moments with your wonderful duo! Such a beautiful post. It brought tears to my eyes and I don’t even own a dog! Aw crap. You made me miss my incredibly stupid but amazingly cute, wonderful, and loving Lhasa Apso that I lost in the divorce. I never thought I could get so attached to “just a dog” – but there you have it! I absolutely LOVE the dog tales, although I am sorry for your loss. Big hugs!! Thank you, thank you. That was so lovely, and made me think of my pair of pups who are waiting for me on the other side of the Rainbow Bridge. Pingback: Year-End Statistics, Award Trivia, and More ~ This is What Happens When a Cold Bug Plants a Blogger at the Computer for the Day | Travel. Garden. Eat. 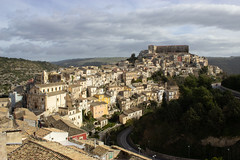 Pingback: Christmas Tree of Memories | Travel. Garden. Eat. Pingback: Unconditional Love (30 Days of Gratitude: Day 4) – Travel. Garden. Eat.